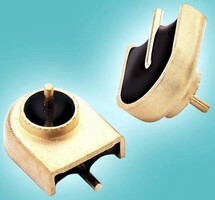 Bell Pin(TM) surface-mount feedthrus are constructed with gold-plated Kovar base and center conductor fired in place with low-loss corning glass. Able to be used at J and K band frequency ranges, products are offered with .009 in. dia pin option and deliver 50 ohm performance. They work with lightweight aluminum or brass housings, mounting to bottom of package to create true surface-mountable parts. Parts also help reduce weight in microwave packages. HAMPSTEAD, NH-February 27, 2008 - Thunderline-Z, a designer and manufacturer of soldered and direct sealed hermetic packages and RF, DC, and capacitive feedthrus, is pleased to announce an expansion to its line of innovative Bell Pin(TM) surface-mount feedthru products. Bell Pins provide a low-cost and higher-frequency alternative to glass-to-metal feedthrus, and are constructed with a gold-plated Kovar base and a center conductor fired in place with low-loss corning glass. The latest development in the Bell Pin line is a smaller-diameter pin option of .009". It is designed for frequency operation through 25 GHz. "The engineering of a smaller pin in our new Bell Pin is the key enabler in giving our customers use of this feedthru style at the increasingly popular J and K band frequency ranges," says Debra Breed, general manager at Thunderline-Z. Bell Pins work with lightweight aluminum or brass housings, easily mounting to the bottom of the package to create true surface mountable parts with increased performance. They deliver 50 ohm performance, and are part of a solution to reduce cost and weight in microwave packages. Thunderline-Z (www.thunderlinez.com) is a full-service manufacturer of hermetic feedthrus and fully machined soldered and direct sealed packages. The company is a leading supplier of feedthrus and packages to the microwave, commercial wireless, telecommunications, hi-rel military, medical, and aerospace industries. Thunderline is a part of the Fusite Division of Emerson Corporation. St. Louis-based Emerson (www.emerson.com) is a global leader in bringing technology and engineering together to provide innovative solutions to customers in process control; electronics and telecommunications; industrial automation; heating, ventilating and air conditioning; and appliances and tools. In fiscal 2007, Emerson (NYSE: EMR) announced net sales of $22.6 billion, an increase of 12% from fiscal 2006.